It’s really difficult to work for a travel company without being inspired to travel to all the places yourself, so this trip was born from a mix of needing an Easter time break somewhere fairly close to home, (I had NO summer holiday booked AT ALL at this point and was panicking) and professional research for a blogger trip to Cologne. 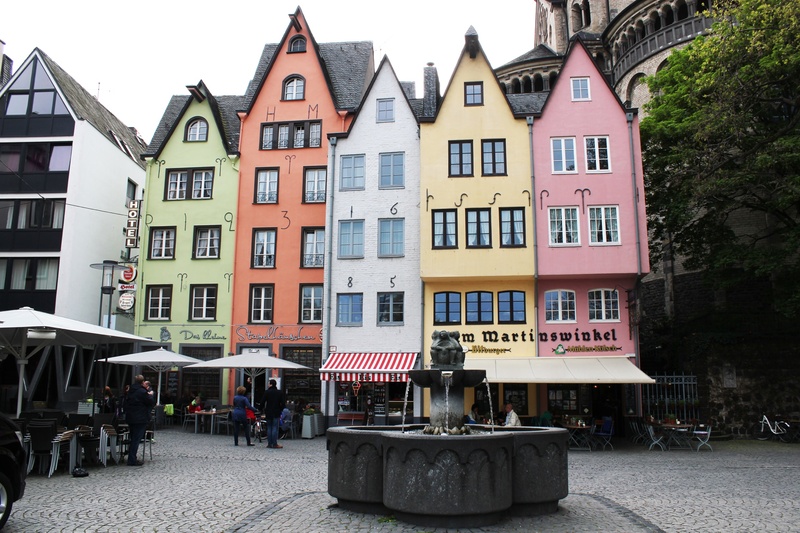 I’d never been to Germany at all prior to this, and when choosing which German city to head to that had good rail links from Amsterdam it didn’t take long to decide that Cologne was our city of choice. 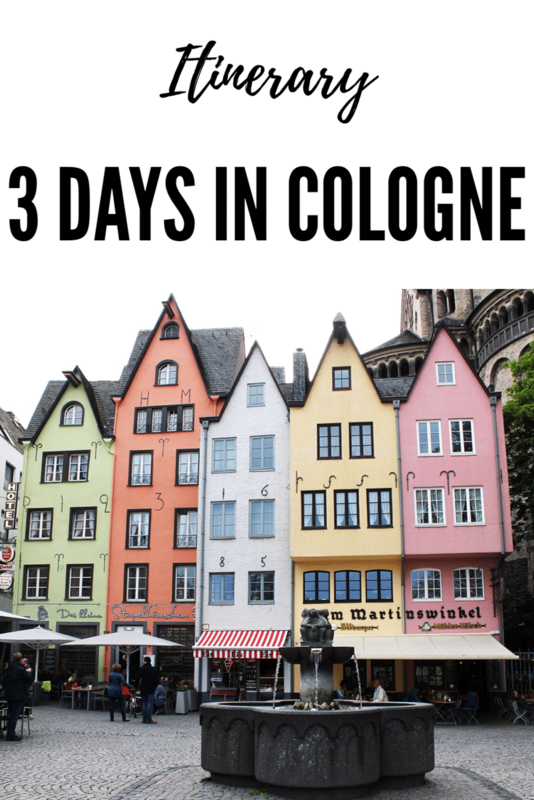 We wanted German authenticity, reachable by a fairly short train journey, somewhere we couldn’t get to via a direct flight from Newcastle, and a city with plenty to see across a 2 night stay. We booked the ferry from Newcastle to Amsterdam, which set sail on the Thursday evening and arrived the following morning. Based on previous experience I anticipated the transfer into Amsterdam would get us there between 11-11:30, so I booked the 12:30 direct train from Amsterdam Centraal to Koln (Cologne) via RailLink which would get us there by 3:30pm. This sounds like a hell of a long travel time but the ferry is fun, and it’s worth it to be able to get somewhere for a short break that doesn’t involve a 3 hour plus drive to some other airport in the UK. Add up the time and cost and it’s not much more of a benefit. For the return journey, we just had to make sure we were at Amsterdam Centraal for the bus transfer back to the ship for between 3-4pm. I booked an 11am train which fit with hotel check out times and left time for any delays. 99% of the time I book hotels through booking.com, as it’s easy to make lists of favourites to compare, prices often drop if you browse for a few days and they have the book now pay later option which is always a plus. For this trip I actually booked directly with the hotel, as the one I selected, Hotel Mondial am Dom Cologne by Sofitel, was part of Le Club Accor Hotels group. With Accor Hotels you can earn points through their loyalty scheme and receive discounted prices so I like to use them directly. I’ve previously stayed in their hotels in London and Paris so knew it would be good. As well as all these benefits it was 5 mins walk from the station (and I was aware at this point of travel times, I didn’t want a transfer as well), right in the heart of the city and the price was reasonable for 2 nights at 315 Euros. 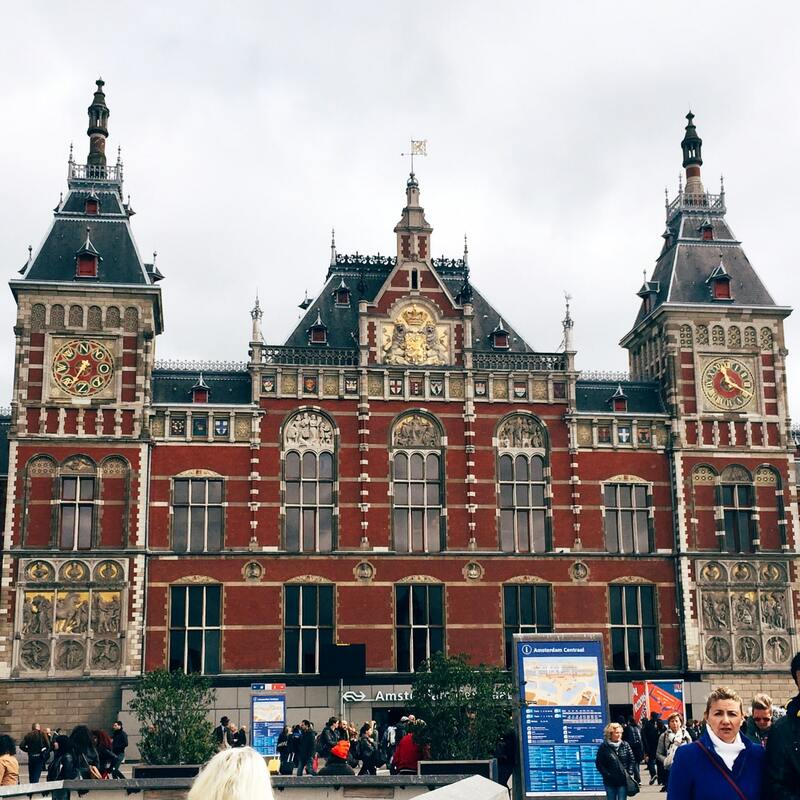 11:30am – Once we arrived in Amsterdam we had an hour to kill before our train so had a coffee in the Starbucks inside the station. It’s a really old, grand, Starbucks, the dark wood, sweeping archways and leather chairs give it a ‘New York City library’ type feel, and you can pass the time looking out the window at the world bustling by in Amsterdam. 12:30am – The train from Amsterdam to Cologne passed through the Dutch and German countryside, and if I’m honest, I was a bit worried what we would find when we got there. Every German town we passed through seemed grey and cold, with nothing interesting to see especially compared to the pretty Dutch ones. It wasn’t the pretty German scenes I’m used to seeing on Instagram, but then I reminded myself how much I love Newcastle despite what the inside of Metro stations look like, and told myself to calm down. 3:30pm – The approach to Cologne was totally different, crossing the impressive Rhine river and seeing the two spires of the cathedral ahead was enough to convince me it actually would be full of character. Lets just say it was more reminiscent of crossing the Tyne on approach to Newcastle rather than metro-ing through Manors. The five minute walk to the hotel was easy, and as soon as you walk out the station all you can see is the massive Dom Koln (Cologne Cathedral) looming above you. 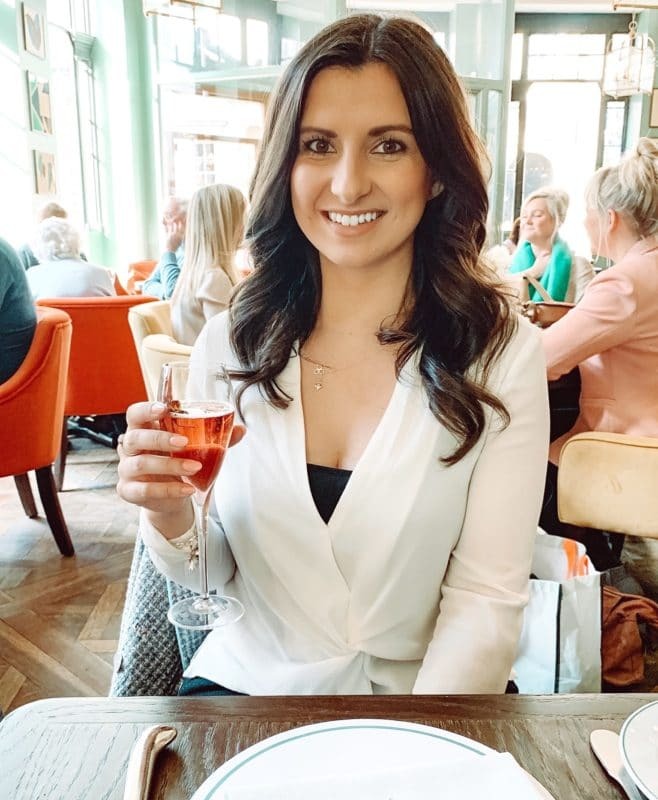 4:30pm – Once checked in we went for a walk towards the river, which due to the warm weather was buzzing with people strolling along the promenade and enjoying the landscaped gardens. Not far along the banks we came across the old town, and were met with those beautifully recognisable, iconic coloured buildings. 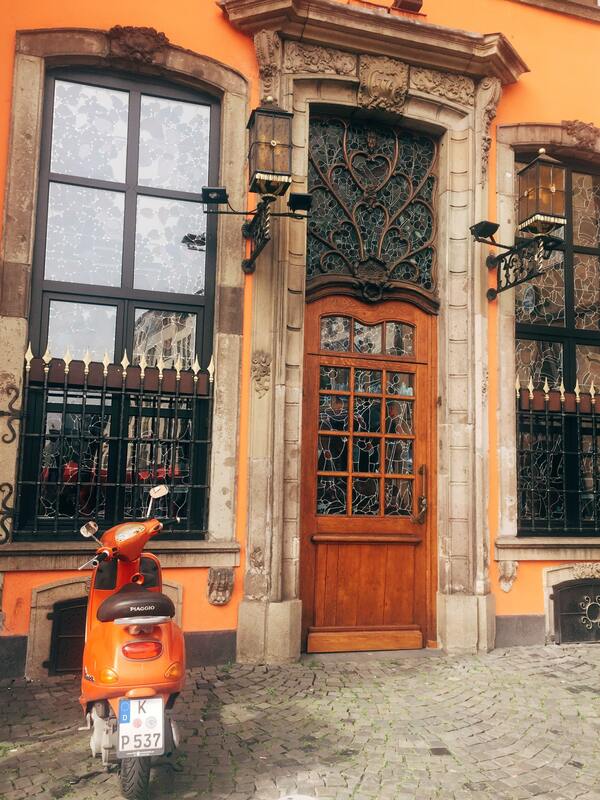 Exploring further and you find yourself lost in the quaint cobbled streets that finally were Instagram-worthy. 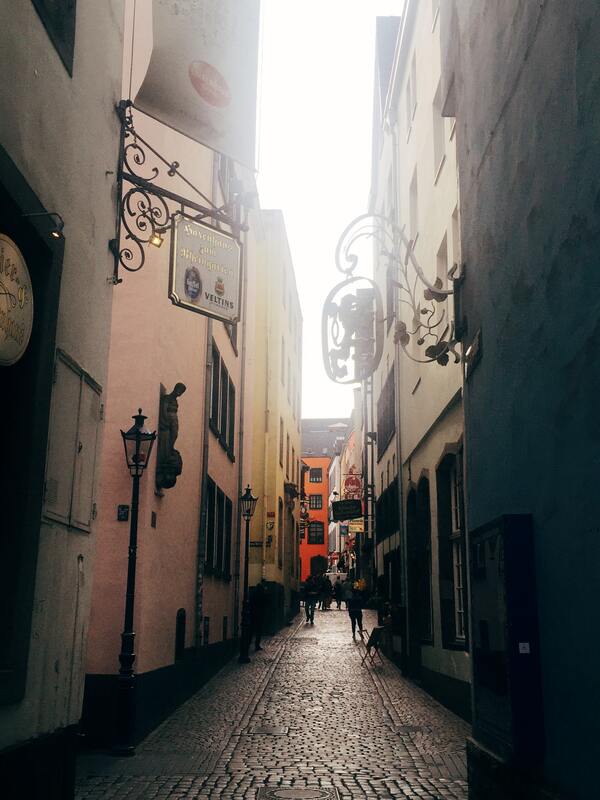 5:30pm – For once I hadn’t researched anywhere to eat in Cologne before we got there, and as we were hungry we tore ourselves away from the old town and ate at the typically touristy front row of restaurants by the river. I’m sure the price was double due to the location, but we picked a busy looking one assuming the food would be nice and it was. 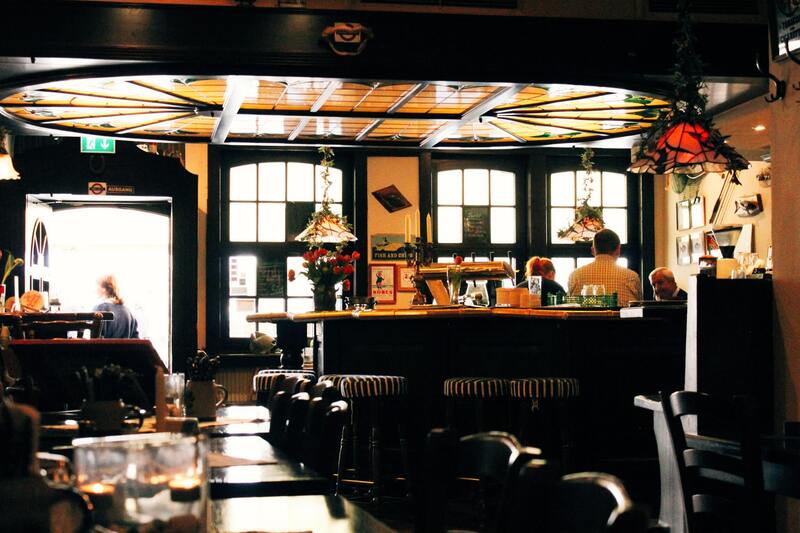 7:00pm – We wandered back into Cologne old town to find a bar, and came across an incredible traditional German Bierhaus. Bierhaus in der Salzgasse only served Kolsh beer, which isn’t brewed anywhere else in the world. Truly authentic! Totally out of our depth (nobody was going to the bar? That’s the first thing you do when you walk into a bar???) a big burly waiter took one look at our confused faces and boomed out ‘ZWEI?’. Yes, we would take two kolsch and propped ourselves up on a beer barrel. 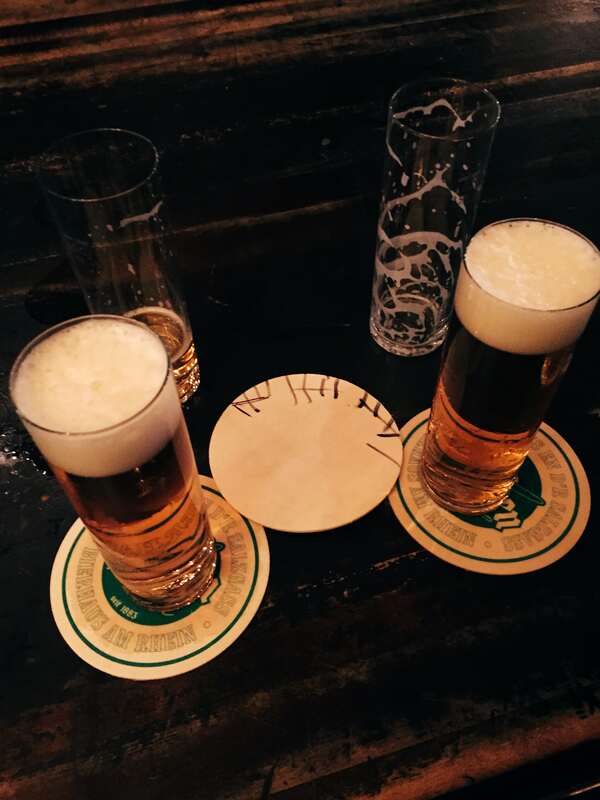 Once handed to us the waiter flipped over a beer mat and tallied off the two beers. We stayed there the rest of the night. 10:00am – Breakfast at Cafe Reichard was recommended to me by a blogger, who said the coffee was amazing, so we went for breakfast. It really reminded me of a German version of Betty’s, without the Yorkshire friendliness! By now we were starting to understand that in Germany you don’t wait for pleasantries, you just go in and sit down, regardless of how posh it looks! They won’t welcome you in, they won’t seat you, they’ll just walk straight past you and it’s just how they are. Cafe Reichard was beautiful, and after enjoying a continental breakfast I thought it was a cross between Betty’s in England and Angelina’s in Paris. Not a bad combination! 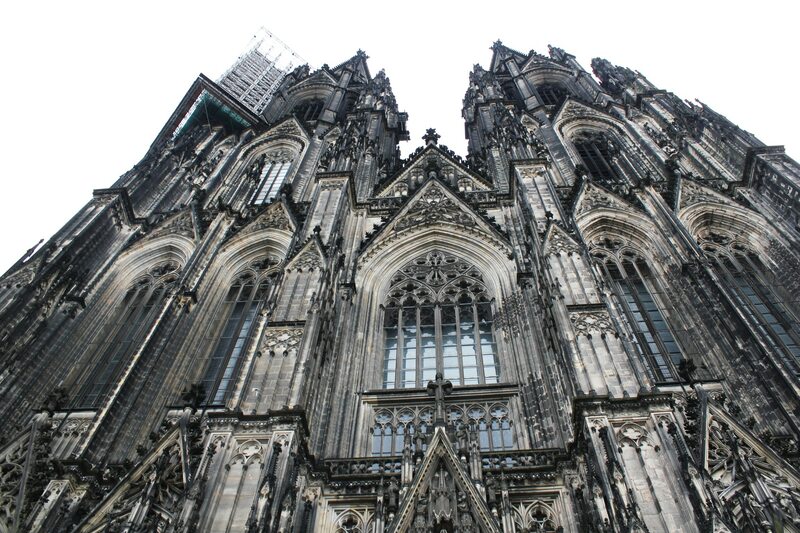 11:00am – Directly opposite the cafe was the famous Cologne Cathedral, so once we finished breakfast we went for a look. Free to the public it is well worth spending some time looking around. Staring up at the towers that were finished in 1880, you can’t tell but the north tower is 7cm taller. The detail of both inside and outside is very impressive, and the sheer size of it had me thinking it’s a miracle it survived the second World War. As you walk around the interior enormous tapestries catch your eye between the pillars. 12:30pm – Walking away from the river into the centre of the city we came across Haus Neuenburg, an old cigarette factory that is now city council offices on Gülichplatz, Old Town North Cologne. The Fastnachtsbrunnen fountain outside is one of many designed by German sculptor Georg Grass Egger. 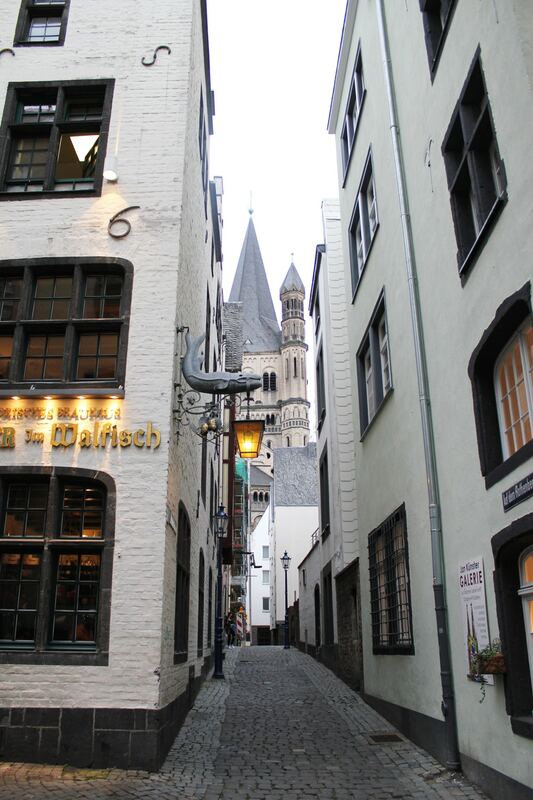 1:00pm – A walk further into Cologne and through the shopping area, we came out in a noticeably more affluent area near the Hahnentor, one of twelve old city gates that used to make up the city wall. Known as the Royal Gate, located in the Rudolfplatz area as historical Kings passed through it as part of their coronation. Nowadays it provides a lovely backdrop for the flower and food market. 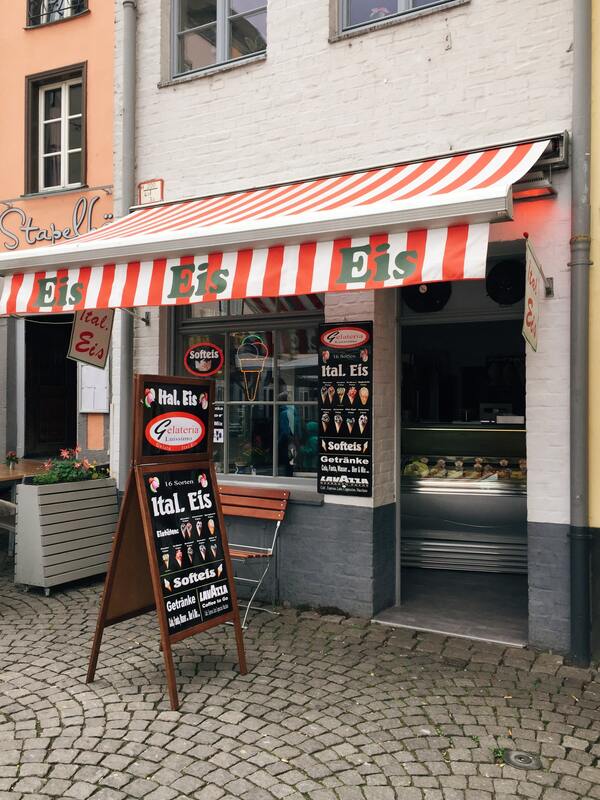 1:45pm – Wandering through the street food market was starting to make us hungry, especially the bratwurst and pommes frites on offer, but we wandered back through the attractive German streets back towards the river. 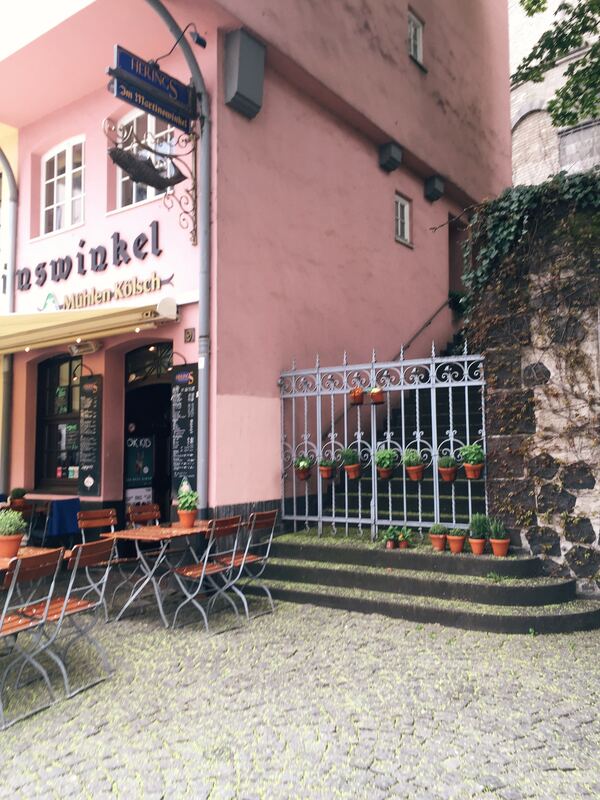 2:00pm – Venturing back into the old town for lunch we ate at Herings im Martinswinkel, a traditional pub serving local delicacies, particularly hering, from its prime spot in the orange of the coloured houses. 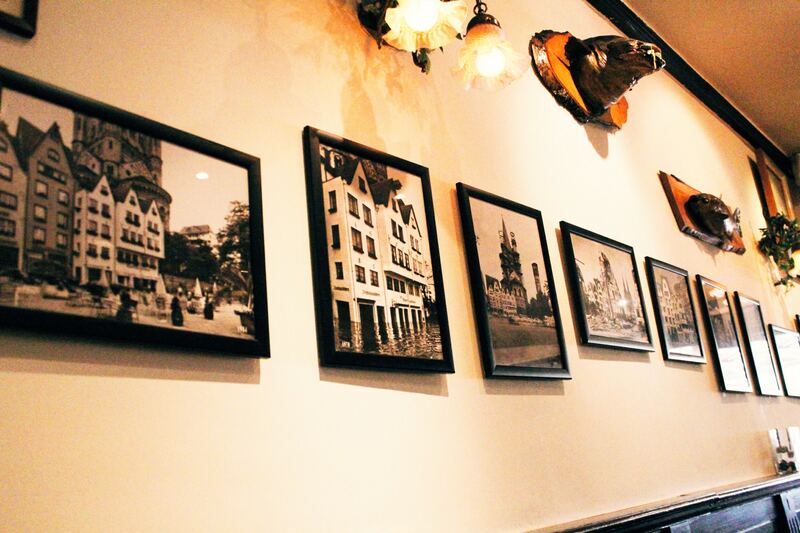 We had hearty German dinners and enjoyed looking at the history of the houses that was displayed in photos on the wall. Top Tip! Try the mango or coconut ice cream flavours from the blue house ice cream shop next door for desert! 3:00pm – Before embarking on the next big sight to see we had a browse around the old town again while it was still light. 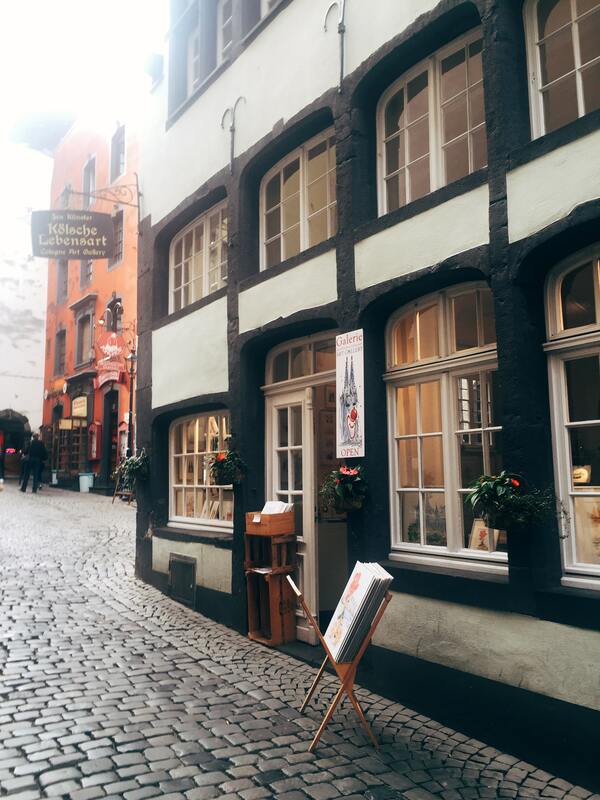 The streets are so pretty, made up of unique buildings and locals were spilling out of bierhauses at every turn. It made for a really genuine atmosphere and wasn’t at all overrun with tourists, in fact I can’t say I noticed any other than ourselves. 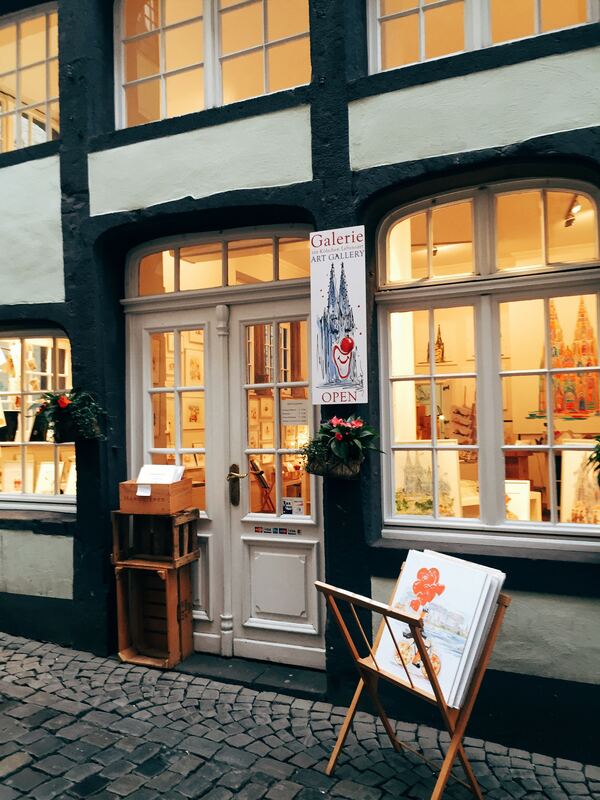 We found a really cute little art gallery, a great place to pick up some artistic prints of this captivating city! 4:15pm – We may have been starting to get tired feet by this point, but we couldn’t visit Cologne without walking over the Hohenzollern Bridge. We head that way next and took the walk across the Rhine, past all the charming love locks that have been a long standing feature of the Hohenzollern. I did notice that half way along the bridge does seem to be leaning, I hope that’s not due to the locks as they do look so pretty and it would be a shame to remove them! The Hohenzollern is one of 7 bridges that crosses the river, and definitely the most iconic. Turning backwards the view from the middle of Cologne’s famous bridge back to the city is the one that everyone wants to see, with the cathedral and the Great St Martin Romanesque church dominating the skyline. 6:00pm – One last thing before a well earned rest was the Lindt Chocolate Museum a short walk along the river, or if you time it right you can catch the shuttle and save yourself the walk. We were too late to do a tour of the museum but we did sample the delicious waffles & hot chocolate in the cafe! 8pm – After a rest and freshen up back at the hotel (this was when I was so glad I chose the hotel we did, so close to everything!) we actually went back to the same bierhaus we found the night before. 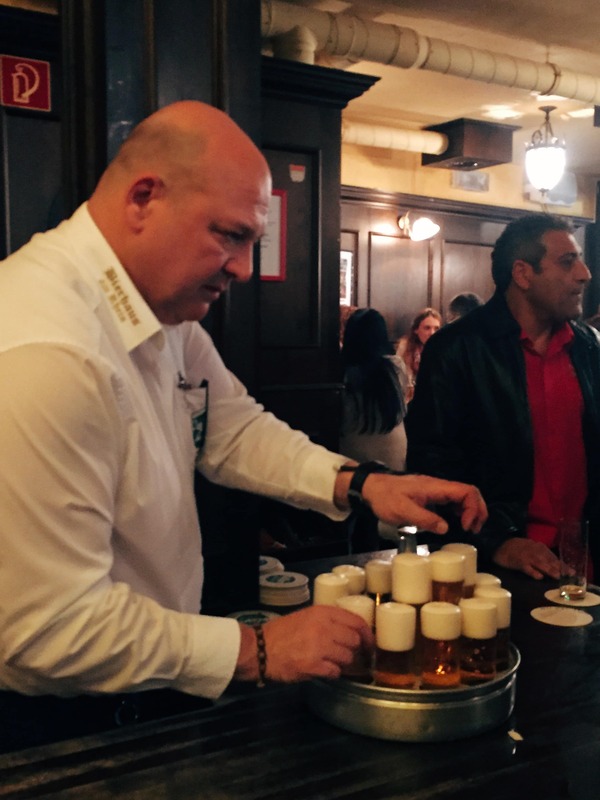 They served goulash, pretzels and any number of traditional hearty German food, so we ate there before spending the rest of the night tallying up our kolsch on the back of a beer mat again. 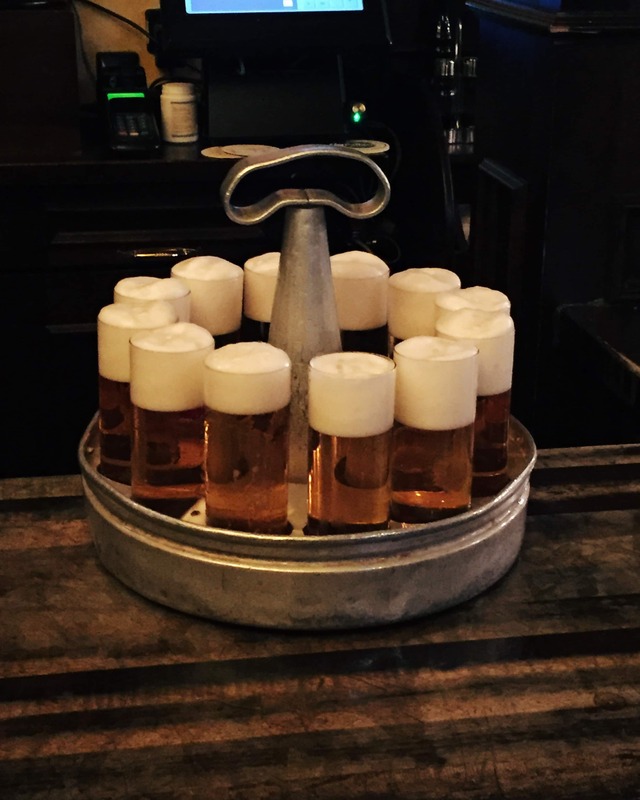 It was so strange to not be served at the bar, each waiter just filled up his tray with kolsch and handed them out on repeat. We had a great night and felt fully confident by the end of it, compared to how lost we felt when we had first walked in. 11:00am – Checkout and train back to Amsterdam for the transfer to the ship and overnight sail home. That journey in sounded like a monumental struggle. I almost feel bad for the fact that my fight from London to Cologne was £9.99. Good effort. Would’ve been interested to know who you were travelling with, as it does make a difference on what you want to be doing. we got the ferry over to amsterdam and spent a few days there as well, flying is obviously quicker but the ferry was fun we had a lovely steak! Have you been to Rhine valley before? I have booked tickets to Cologne, have 5 nights, and planning to keep it mainly to the Rhine and Mosel valleys, apart from Cologne city of course.